Quilts by Molly Allen, Rita Merten, and Joan Schulze at the San Jose Museum of Quilts & Textiles. 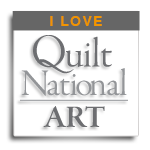 Quilt National 2013 (collections A & B) is now on view at the San Jose Museum of Quilts & Textiles. Deborah Corsini, curator for the museum, has hung the show with thoughtful placement of works in the museum’s main galleries. 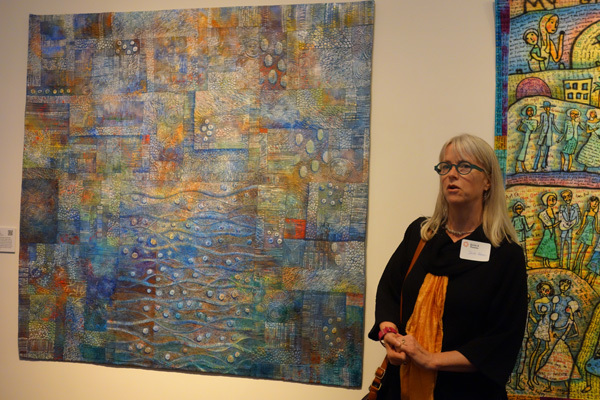 The opening reception for the show was held on Sunday, May 18, in conjunction with a celebration of the San Jose Quilt & Textile Museum’s 37th anniversary, and a special artists gallery walk through the Quilt National exhibit. The San Jose Museum of Quilts & Textiles is a special venue for viewing Quilt National 2013. The three large gallery spaces provide room to enjoy the artwork both up close and far away, enabling exploration of both the exquisite craft and overall composition of each piece. The beautiful lighting in the museum shows the Quilt National 2013 works to their best advantage. Seen from across the large spaces, some works, like Deidre Adams’ Tracings III and Judith Content’s Cenote Azule actually glow. 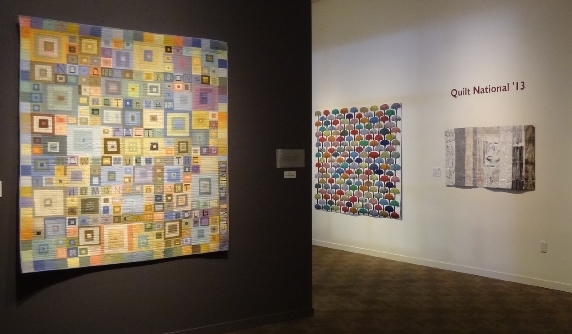 The Quilt National 2013 artworks have been hung so as to suggest subtle themes of color, content, and composition. In many cases the artwork seems to whisper quietly to its adjacent neighbors, as on the wall of subtle yet powerful artists quilts by Ellen Noble, Carol Goosens, Leslie Bixel, Judith Content and Jan Myers-Newbury in the main gallery, or the environmental themes of three quilts in the grey gallery by Leslie Rego, Katherine Knaur, and Nelda Warkentin. The overall effect is an enjoyable, inspirational, and intriguing experience. 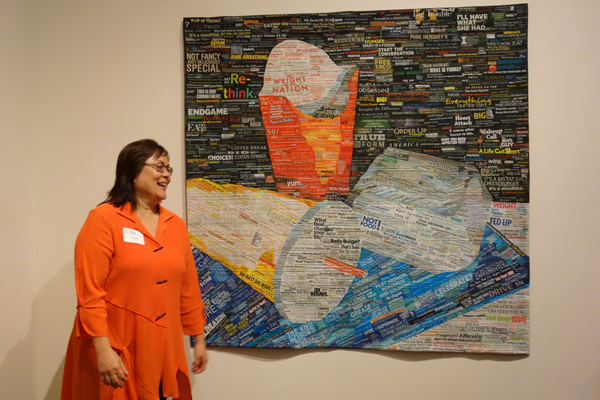 Seven Quilt National artists were on hand to participate in a gallery walk through the exhibit. Each artist shared their stories, inspirations and techniques. Leslie Rego spoke passionately about her love for the natural beauty of Idaho, and how it informs her work. Laura Fogg told the story behind Jammin’, and how she just happened to be at an event with her sewing machine and strolling musicians, enabling her to sketch with her machine from life. Kris Sazaki described the process of making American Still Life – The Weight of the Nation with her partner “Pixelady” Deb Cashatt, as one of the funnest experiences in her life. Deidre Adams talked about the unique “post quilting” painting technique she uses in her work. Leslie Bixel spoke to the theme of her quilt, Decay and the surface design techniques of rusting and bleach discharging cloth that will also decay over time. Wrapping up the event, Judith Content explained the arduous process of judging a Quilt National biennial competition, and her own experience in judging Quilt National 2013 with fellow jurors Linda Colsh and Penny McMorris. Judith also talked about her quilt Cenote Azul and the magical light of the skies in Pinnacles national park that inspired it. 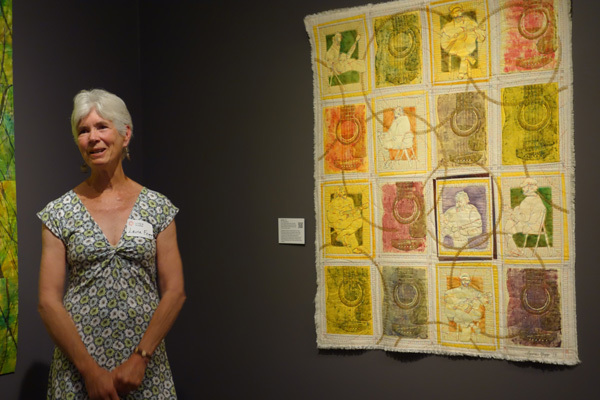 To find out more about the Quilt National 2013 exhibit at the San Jose Museum of Quilts & Textiles please visit their website for hours and upcoming events, including a special Fiber Talk organized by Curator of Collections, Nancy Bavor. Ticket information is here on the museum website.